Note: The cutting file has been submitted to Silhouette and can be downloaded here. 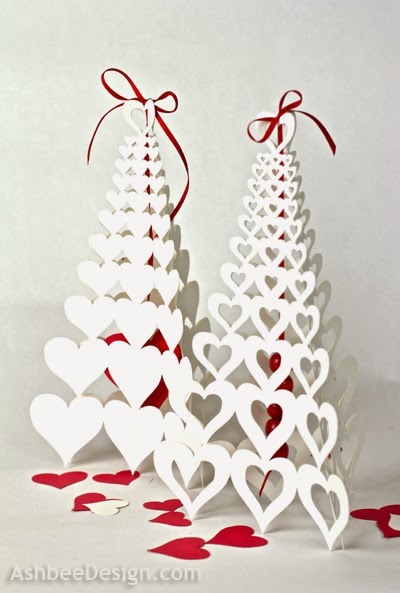 Tother styles of Valentine trees for paper cutting are available here. here is a solid heart version as well and it can be downloaded here. 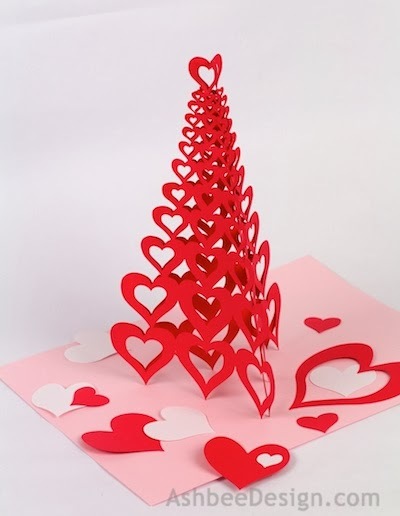 Here is another 3D tree design, this time for Valentines Day. I designed and made this shortly after getting my Silhouette about a year ago. It is a complex cut with easy construction afterwards! 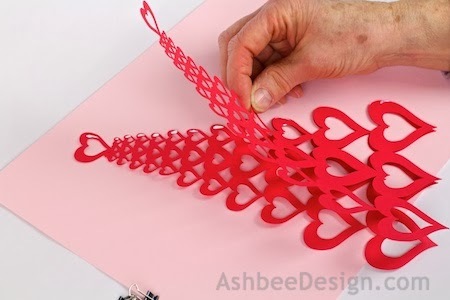 I have uploaded two different patterns for this tutorial, one has solid hearts and the other is open. 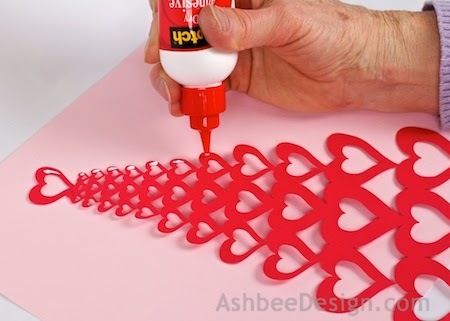 You can resize the pattern and make a collection in various sizes and shades of red, pink and white for a stunning centerpiece. It is both Cameo and Portrait friendly. 1. Download the cutting file for your Silhouette Cutting machine from the Silhouette Online Store. This is what the file looks like. Cut 3 times from card stock. 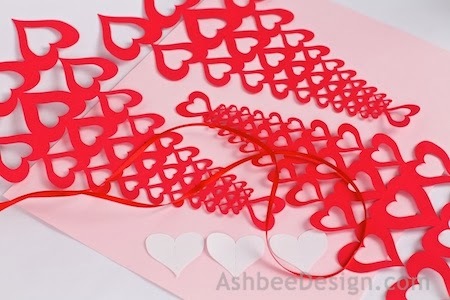 I have also cut white hearts and suspended them in the center using red ribbon. That is an optional step. 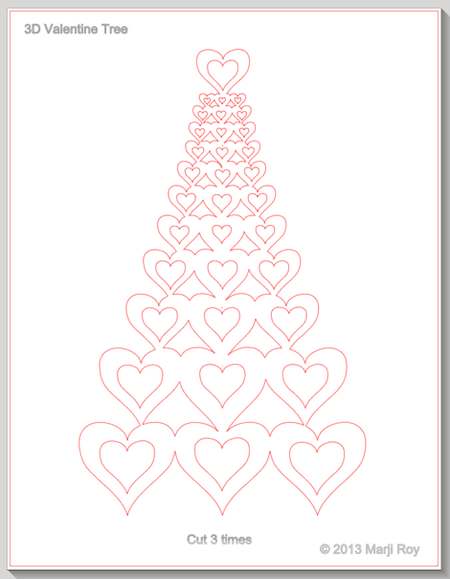 I added the extra heart pattern to the Silhouette file incase you want to put hearts in the center as well. 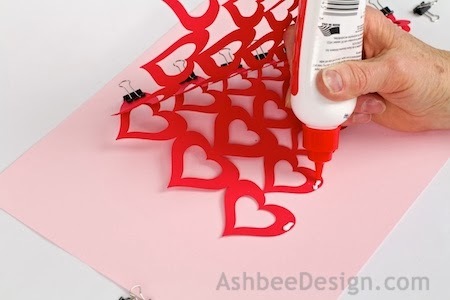 Apply paper glue to the tips of all hearts on ONE edge of one tree. Don't go in further than 1/4" from the edge. Place a second tree on top and press together. Clip with mini binder clips to hold until dry. You can proceed with the other sides as it is drying. Turn back the top tree from the open side and apply glue to the first couple of tips again only going in about 1/4"
Place the third tree against them working it between the two trees already together. They will bow apart. 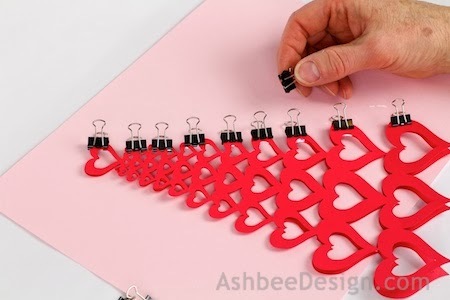 Quickly add tiny binder clips to hold them in place while the glue dries. It is easiest to work a few ends at a time on each side and slowly move up the tree. 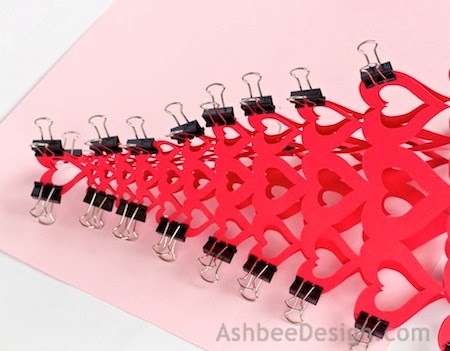 Glue the third seam together and add binder clips to it as well. Allow the tree to dry and then remove all the binder clips. And the first tree is done! 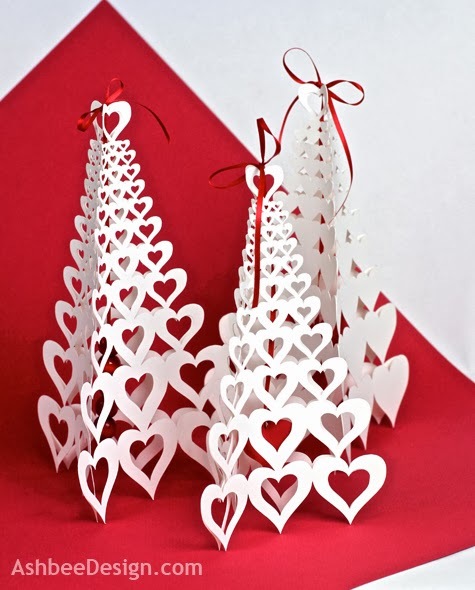 Try the other cutting pattern with the solid hearts but also try re-sizing and creating a forest. Here is a pair I cut in white index stock. 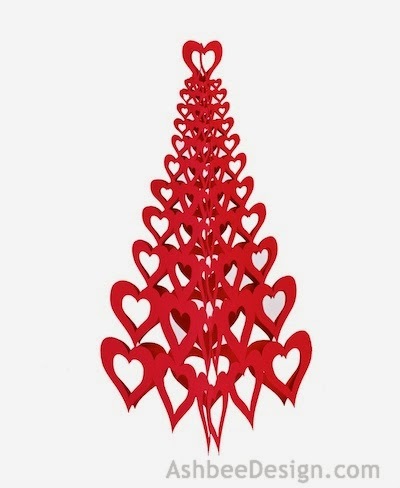 One has a red heart hanging in the center. The other has a string of red wooden beads. Be creative! This is adorable! I am glad you shared it at diydreamer! I am not sure if I would be as successful as you with this project but it is so cute.